HAPPY BIRTHDAY to Georges Seurat!!! Georges Seurat was born on December 2, 1859 in Paris, France. His most famous painting, A Sunday on La Grande Jatte-1884, was painted from 1884 to 1886. Seurat was very interested in science. Georges Seurat died on March 29, 1891 in Paris, France. 1. He was very interested in science. 2. He was most known for a painting style called Pointillism. 3. He only painted seven wall-sized paintings and 60 smaller paintings and drawings during my life. 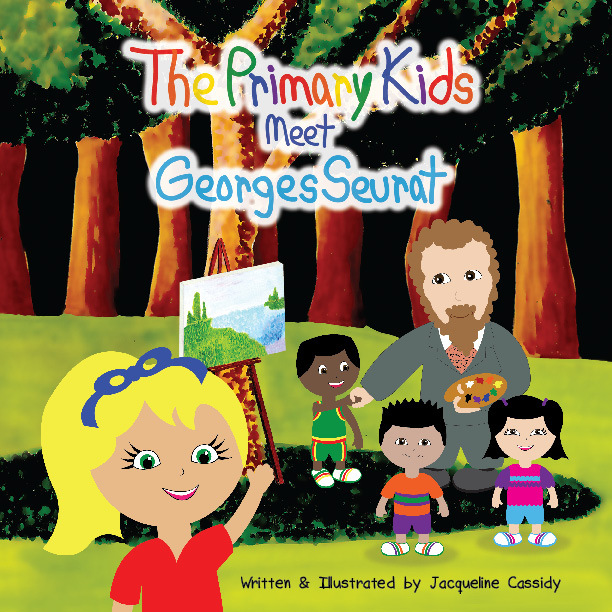 There is so much more The Primary Kids learned from Georges Seurat…and they share it all with you in…The Primary Kids Meet Georges Seurat! The Primary Kids want to wish Georges a very Happy Birthday, we couldn’t have done it without you! “Art ignites the flame of curiosity that lights our path through life.” – Jacqueline Cassidy Jacqueline, an Elementary and Middle level art educator, is the founder of The Primary Kids®. While looking for children’s art storybooks that she could integrate into her classroom lessons, Jacqueline found an absence of well-written stories with interesting characters that were not only engaging but also educational. She took her love of art and passion for education to create a product that will inspire young creative minds. Enter your name to download your free Elements and Principles of Art poster set featuring The Primary Kids. We hate SPAM and will never sell your emails.